Oven Baked Pork Chops are so delicious. Smothered in cheese and a delicious bread crumb topping, this is an easy dish that is sure to satisfy even the most picky family. 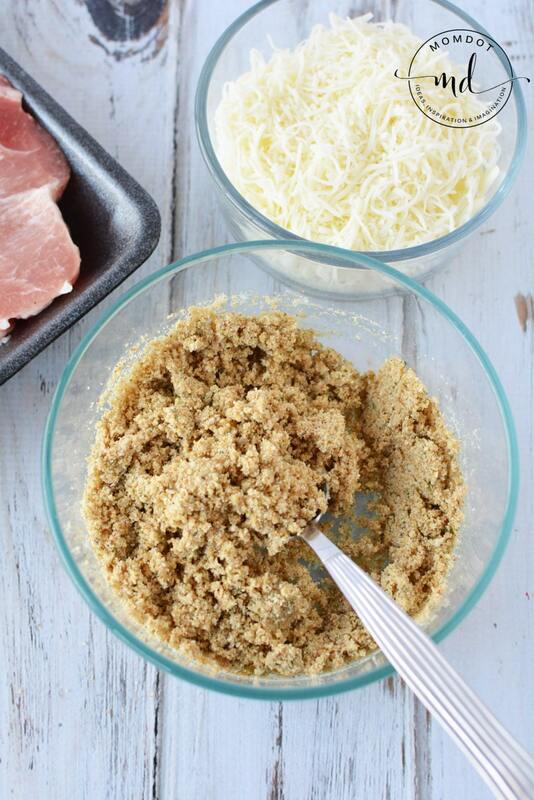 Better than shake n bake, this delicious crust is perfect for baking your pork chops. Simple prepare in a bowl, top, and place in oven. Its as easy as it sounds! You will be enjoying your smothered, covered and perfected oven baked pork chops quickly! These boneless cops were just about 1 inch thick, so the time is approximately 30 minutes. If you use a thicker or thinner piece, make sure you adjust your time. Pork should have an internal temperature of 145 degrees Fahrenheit and spend approx 3 minutes resting prior to eating. You can read official cooking guidelines here. I also have a pork chop recipes guide here and share all there is to know about grilling, baking, types of pork and more! Preheat oven to 350 and spray a baking pan with nonstick cooking spray. 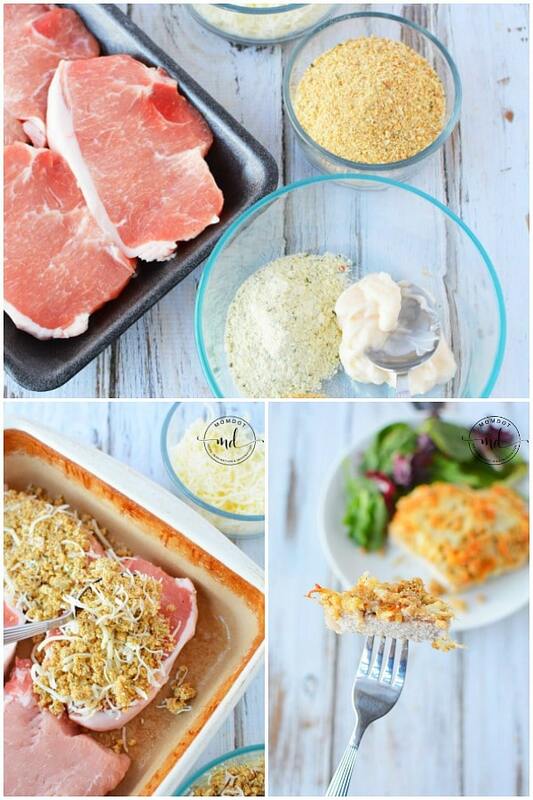 Place pork chops in a single layer in baking pan and sprinkle with salt and pepper. Set aside. In a small mixing bowl, add mayonnaise, ranch seasoning and garlic powder and mix well. 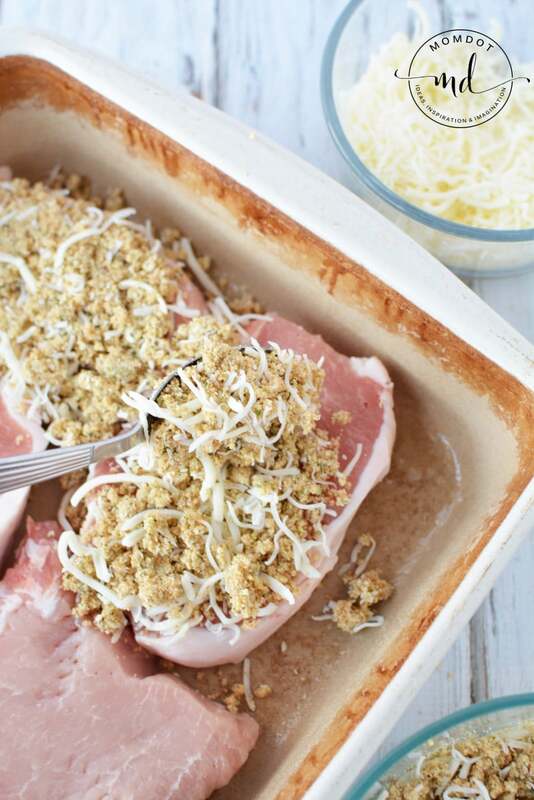 Stir in bread crumbs and half of cheese and mix well. Mixture will be crumbly. Sprinkle over pork cops, pressing into meat. Top with remaining cheese. Bake, uncovered, for 30 minutes or until pork is no longer pink in the center.